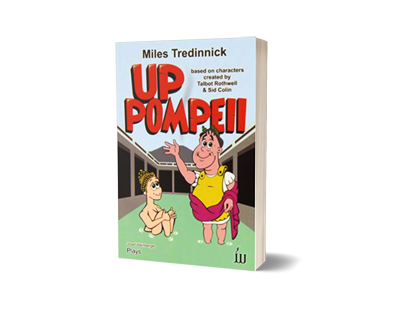 Back in the day when I wrote for Frankie Howerd he asked me to write a brand new stage play based on his most successful TV show Up Pompeii. Frankie’s plan was to do a UK tour and then perform it in the West End. We were just about to roll into action when Larry Gelbert asked him if he would reprise his role as Pseudolus in A Funny Thing Happened on the Way to the Forum at the Piccadilly Theatre. As there is only so much Roman slavery a man can do, Up Pompeii was temporarily put on the back burner but you can read the full story here. Fast forward a few years and theatre producer Bruce James heard about the play and tracked down a copy. Fortunately it made him laugh enough to produce a UK tour starring Damian Williams as Lurcio the slave (see promo clip below). Up Pompeii is now back entertaining audiences with Lurcio, Ludicrus Sextus, Ammonia, Erotica, Senna the Soothsayer and others. So many thanks Bruce! Up Pompeii are currently available. or to buy the play.